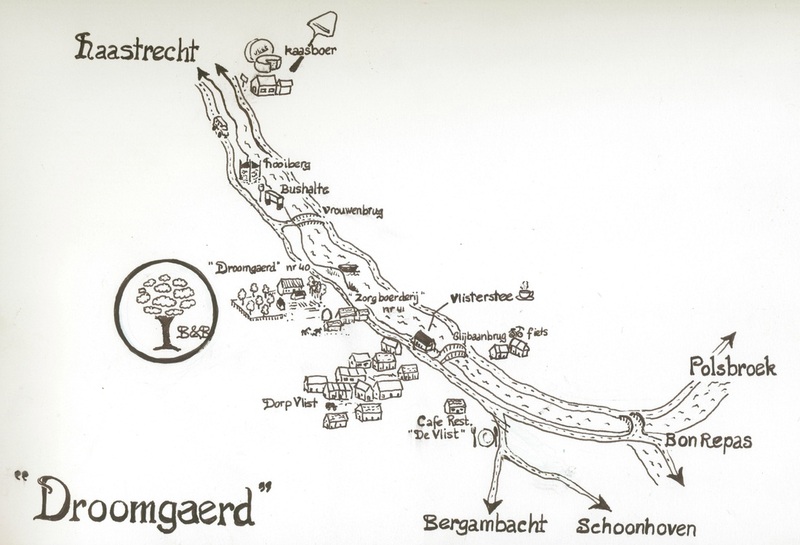 Most likely as a visitor of the Droomgaerd you will come by car or bike. For both there is sufficient place to park on the own area for free. In case you arrive with public transport we offer you the possibility (free of charge) to be picked up as a guest of the Droomgaerd from the train station in Gouda or Gouda Goverwelle in our old timer DS. You can enjoy a special drive to the Droomgaerd for free. The DS provides sufficient place for our guests and their luggage. From Utrecht you take the junction Nieuwegein/Schoonhoven direction Schoonhoven, before reaching Schoonhoven you take on the T-split roundabout direction Polsbroek/Polsbroekerdam and from their you follow the signs Vlist. From Polsbroek you will be directed left over a bridge and than immediately right over the next bridge and again right along the water (the Vlist). After approx. 400 meter you will come through the small village of Vlist with on your right the café de Vlisterstee. You continue following the road until on your left you reach number 40 with the blue Droomgaerd sign. There is sufficient parking place. Be Welcome! From The Hague /Rotterdam you will follow the A12/A20 to the junction Gouda West. You will follow the road in the direction of Gouda to the Locker area and take the direction Haastrecht. You continue following the Haastrecht signs. Upoan arrival in Haastrecht you take the roundabout for a quarter in the direction of Vlist. After approx.. 4 kilometer over the dike you will find on your left an old fashioned haystack. You continue driving and after 400 meters on your right you will find the blue sign of the Droomgaerd number 40. There is sufficient parking place. Be Welcome! Take the train to Gouda CS. From there you take the bus to IJsselstein binnenstad (is not very frequent) number 106. You leave the bus at the stop Vrouwenbrug near the old fashioned haystack. You continue walking in the direction the bus was driving and after approx.. 400 meter you will find the blue Droomgaerd sign number 40 (you can also ask the bus driver to stop at number 40) Be Welcome! From the direction Schoonhoven.In Schoonhoven you follow the signs Bonrepas/Vlist. After leaving Schoonhoven you drive a dangling road next to the river Vlist through the Bonrepas. At the end of this road you go straight and arrive at the Oost Vlisterdijk. After approx.. 800 meter you arrive in the small village of Vlist where you cross the river via a white walk and bike bridge. You end near the Vlisterstee you continue to follow the river (now on your right) and this is the West Vlisterdijk, until you see on your left the blue sign of the Droomgaerd number 40. You can store your bike in the bike store or in the barn. Be Welcome! From the direction Haastrecht. By the roundabout in the centre of Haastrecht you follow the sign Vlist. After approx. 700 meter you follow the road on the dike this is already the West Vlisterdijk. After 3,5 kilometer you will find on your left an old fashioned haystack you continue biking and after 400 meter you will see on your right the blue Droomgaerd sign number 40. You can store your bike in the bike store or in the barn. Be Welcome!